Redmi Note 6 Pro is going to launch in India on November 22. Here are the key differences between Redmi Note 6 Pro and its predecessor Redmi Note 5 Pro. Xiaomi is all set to launch another Redmi Note in India. 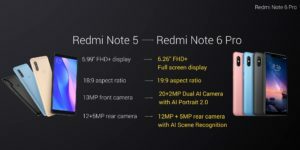 Yes, Redmi Note 6 Pro is the next phone after Redmi Note 5 Pro has successfully grabbed the attention since its launch in February this year. Though Redmi Note 6 Pro will come to India on November 22, it is already launched in Dubai and Thailand. It makes things easy for us to compare both the variants. So, let’s go through the first impressions of the upcoming Redmi Note 6 Pro. Okay. The backside of Redmi Note 6 Pro is quite similar to its predecessor Redmi Note 5 Pro, but Xiaomi has used tougher 6000 series aluminum in making the body of Redmi Note 6 Pro. It makes the phone sturdier than Redmi Note 5 Pro. But the real difference lies in display size and display aspect ratio. With a slightly bigger 6.26 inches display, the Redmi Note 6 Pro looks more impressive than Redmi Note 5 Pro. The phone has a notch on the top and two cameras on the front. The display aspect ratio is 19:9 thanks to the notched screen. It is slightly higher than 18:9 ratio of Redmi Note 5 Pro. Just like the previous version, the side bezels are there with prominent top and bottom bezels. There is no change in the camera combination of 12MP+5MP, but Xiaomi has used superior Dual Pixel AutoFocus sensor in the Redmi Note 6 Pro. The phone has a slightly bigger pixel sensor at 1.4um as compared to the Redmi Note 5 Pro’s 1.25um. Aperture is also improved with f/1.9 from the same at f/2.2 in the Redmi Note 5 Pro. And yes, the Redmi Note 6 Pro will have a dual-front camera instead of a single 20MP camera, which is used in the earlier phone. However, the impact of these minor changes in photos is yet to see. Mobile photography enthusiasts can come up with their expert views soon! The Redmi Note 6 Pro runs MIUI 10 Global ROM based on Android Oreo for now. Both variants are powered by the Qualcomm Snapdragon 636 processor. The Redmi Note 6 Pro will come in the 6GB RAM+64GB and 4GB+64GB storage variants. It has a 4000 mAh battery. We don’t expect much difference in price than that of the Redmi 5 Note Pro. The 4GB option is expected to cost at INR 15,000 minus one, whereas the 6GB RAM phone would cost you around INR 17000. Recently, the company has reduced the price of Redmi Note 5 Pro phones by one thousand rupees for both the variants. It seems that Xiaomi has 10-month upgrade cycle. We can certainly hope that the users of Redmi Note 4 or older versions will certainly switch to the upcoming Redmi Note 6 Pro. It’s interesting to see how it will perform in the Indian phone market where the competition is fairly high.